Here is a list of just some of the many worthwhile programs operating in the Comox Valley. If you are in a position to donate to any of these programs, viagra please do so. If you feel you could benefit from the community’s generosity, gerontologist please contact them for more information. This program is in its 25th successful year providing Christmas hampers to families in need throughout the Comox Valley. With the generous community support through donations and volunteering, viagra sale this program has provided more than 600 families with hampers in the past years. If you would like to make a donation, need a hamper or know someone who needs a hamper please call 250-897-3999 or toll free 1-800-715-3999. Secret Santa provides a means for individuals to anonymously purchase a gift from a real child’s wishlist, and have that gift connected with the child in time for Christmas. Children’s names are submitted to First Insurance; those names and wishes are recorded and then given a pseudonym to protect the individual’s privacy. That information is then transferred to a gift tag decoration, which is placed on a participating Christmas tree at one of several partner locations throughout the Comox Valley. Anyone who wishes to purchase a gift for one of these special children can pick a tag off any tree, go shopping and then return the unwrapped gift to the same location, or any First Insurance office. Volunteers anonymously deliver the gifts December 21. Deadline for presents: December 13. Secret Santa trees are located at: First Insurance, Ascent Physiotherapy, Courtenay Family Chiropractic & Orthotics, Cumberland Dental, Dairy Queen, Driftwood Dental, First Credit Union – Cumberland, Glacier Greens, Fitness Excellence, Georgia Straight Collision, Plates Eatery, Shopper’s Drug Mart – Courtenay, South Country Feeds, Top Shelf Feeds – Black Creek, 97.3 The Eagle and the Comox Valley Record. To register for the program drop by any First Insurance office, or call the Secret Santa line at 250-703-0858. This annual free Christmas dinner for the needy takes place from noon to 2 pm December 25, upstairs at the Florence Filberg Centre in Courtenay. The dinner is free of charge and will contain all the trimmings, cooked and served by volunteers. The dinner is made possible by donations of turkeys, vegetables, cakes, desserts, toys and cash. To volunteer or donate, or for more information, call Rob James at 250-339-1367. 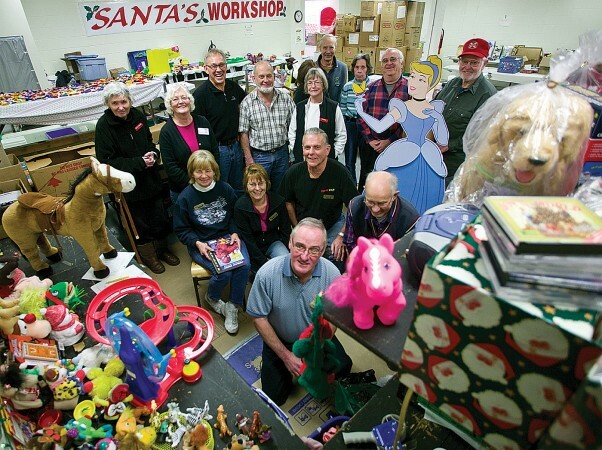 Santa’s Workshop helps parents of the Comox Valley with children between ages 0 and 16 by providing toys for Chrismas. They accomplish this by generous donations of gently used toys, bikes, books, games, puzzles, and cash to purchase items for certain ages groups. You can also help by volunteering your time to help clean, repair or restore, and repackage the toys to get them ready for their new assignment as another child’s cherished Christmas toy. Parents who need their services can call for an appointment (Care Card needed for each child). Santa’s Workshop is open Monday to Friday, 10am to 3pm. For a list of drop-off locations visit their website: www.santasworkshopcomoxvalley.com. Visit the workshop at 877 5th Street, Courtenay from 9-3, Monday to Friday until Christmas. Phone 250-897-1994. Jingle Bell Charity Run – December 8. Bring the whole family for a fun filled 3 km or 7 km poker run/walk at Seal Bay Park and help out the local Food Bank during their time of need. Gather playing cards along the course, and the best hand wins. Great draw prizes, hot drinks and snacks. Check out www.cvrr.ca and follow the link to Jingle Bell Run for more information. The Food Bank is always in need of donations of funds and food for distribution to the needy. Open Monday, Tuesday, Wednesday 9:30 am-noon; Thursday (Distribution Day) 9:30 am-1 pm. Friday 9:30 am-11 am. Closed Saturday, Sunday & Holidays. Located at 1-1491 McPhee Avenue, Courtenay. For more information call 250-338-0615. Saturday, December 7—Bring any food, clothing and toys that you can donate to local Comox Valley charities, including Santa’s Workshop, the Comox Valley Food Bank and Comox Valley Transitions Society. Your One Stop Charity Drop off. Santa will be there handing out treats for both kids and adults. Enter on the Costco side of Rice Toyota and drop off any items you can in the service area straight ahead. Get a cup of coffee or hot chocolate and have a cookie or muffin supplied by Quality Foods. 11am – 3 pm.